When you are thinking about how to make a necklace with multiple wires, you should first consider the size of the beads you want to use. 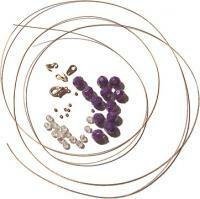 For smaller beads, the wires can be closer together, or the same size to create a clustered effect. Small gaps are created by making each length of wire only slightly larger than the last, while the same sized lengths can also look effective with smaller feature beads. 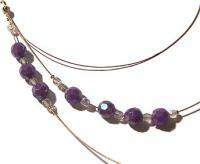 Larger beads generally look better at different lengths, with a greater gap between each one. The bigger the difference in length between each strand, the bigger the gap will be. Either way, try experimenting with different lengths until you find one that you think flatters the size of your beads the most. These instructions can be used to make a necklace with multiple wires - This project will be for a three-stranded necklace. Cut three long pieces of tiger-tail. At this point it is not important they are the correct length, just make sure that each of them is over two feet long. Gather one end of each piece of tiger-tail together, and thread the clam-shell through each one. Pass a crimp through the three wires as well. You might need the nose of the pliers to help pull them through at the same time, or you might find it easier to thread each one through individually through the crimp. Once all the wires are through, squash the crimp and cut off the excess tiger-tail, then close the clam-shell around the join. Each wire will sit in a certain way. Choose the one that looks "on top", and select this one as the first wire. crimp, crystal, purple, crystal, purple, crystal, purple, crystal, crystal, crimp. Do not squash the crimps yet. Hold the clam-shell at the back of your neck, and in front of a mirror wrap the necklace around until it meets up. 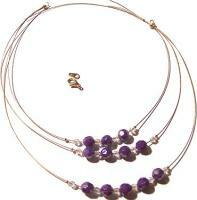 Make the beads sit just below your collarbone, and hold the wire in place with your hands. Using the pliers, fold the tiger-tail in half and press with pliers to sharpen the bend where you had held it around your neck to mark it. Anywhere after this point, squash a crimp on the tiger-tail to hold the beads in place on the other end while you work on the other wires. crimp, crystal, purple, crystal, purple, crystal, purple, crystal, purple, crystal, crimp. Do not squash the crimps. Make this wire two inches longer than the one above it, and bend the wire at this point using the pliers, squashing a crimp anywhere after this point to hold the beads in place while you finish the last wire. crimp, crystal, purple, crystal, purple, crystal, purple, crystal, purple, crystal, purple, crystal, crimp. Do not squash the crimps at this point. Hold the ends of each of the three wires, and cut off the two crimps you had used on the other wires to hold the beads in place while you worked. Thread a clam-shell through each wire, followed by a crimp. Allow it to sit where you made the bends in the other two wires, and on the third wire make it sit so it is two inches longer than the second wire. Squash the crimp in place, then close the clam-shell. 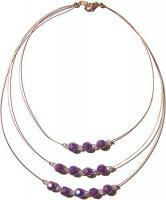 Hold the necklace up, and allow all the beads to fall to the middle of each of their strands. Once they are in the middle, squash the crimps on either side of the groups in place to hold the beads in place. Hook the necklace catch and the parrot clasp on each of the clam-shells loops, and close it using the pliers. Now you know how to make a necklace with multiple wires, use this technique to create necklaces than have more wires, or more groups of beads around the wire, or try using larger or smaller beads. It is a very handy skill that can be used to make a necklace with multiple wires, multiple ways and unlimited possibilities! query: INSERT INTO accesslog (title, path, url, hostname, uid, timestamp) values('How to Make a Multiple Wire Necklace', 'node/20', '', '3.84.182.112', 0, 1555950394) in /home/surelion/public_html/drupal-4.6/includes/database.mysql.inc on line 66.